Click on the task bar with the right mouse button. The task bar is at the lower edge of the screen. Move the mouse over the Toolbars entry. 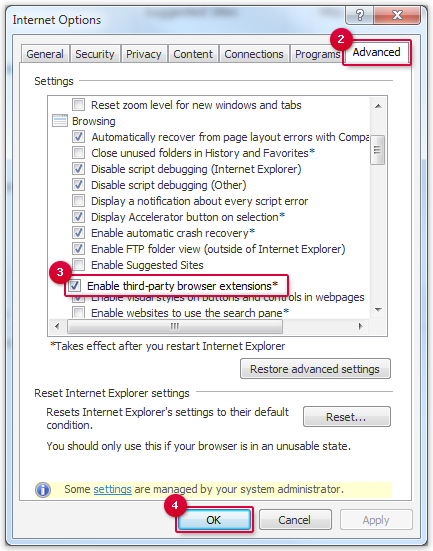 Set the checkmark next to Enable third-party browser extensions*. 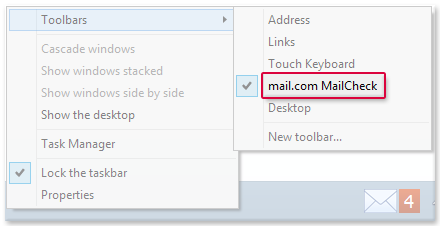 If you use MailCheck for Internet Explorer, you can use the Repair Wizard to repair it. Open the mail.com MailCheck folder and start the Repair Wizard. Click on Repair and follow the on-screen instructions. Move the mouse to the upper right hand corner of the screen and click the magnifying glass icon. Enter MailCheck in the search field.